Seasoned online marketers have an excellent command over their email marketing strategy. They go over every detail, utilize the ideal text-to-image ratio, and choose catchy graphics to garner engaged readers. However, this luxury is mostly out of bounds for startups and small businesses due to budget constraints. As a result, they end up assigning a lower priority to email marketing. This article has a few useful tips on how to significantly impact conversions through email marketing. Email Marketing has been proven to be more effective when you reach out only to your target audience, rather than spraying emails everywhere, like bullets from a machine gun. The best way to get this done is to invite people to sign in to your website news letter or for promotional emails with special offers. 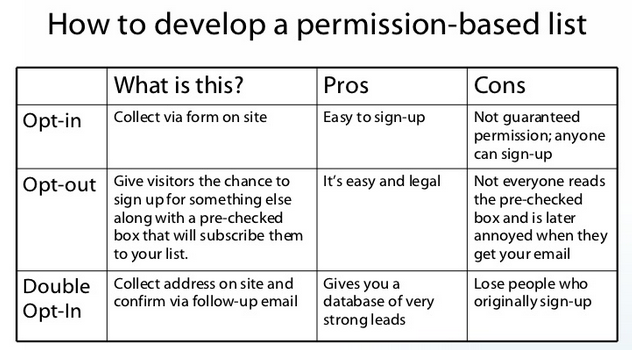 The grid given below talks about working off a permission based list for your email marketing campaigns. Don’t Create a Maze of pictures! Your emails should focus on a balanced text to image ratio. Sending out an email with only graphics and no text could be a concern, since users may not download the images due to bandwidth issues. This could lead to a dampener to your spirits, since you might have spent precious hours in selecting catchy graphics. Once you reduce the extra graphics and replace that with compelling text, you’ll be able to comprehend if customers are reading the email and using the text information to click through to your website. Much has been written about the importance of subject lines, but it’s never enough. If you’re selling discounted home electronics on your website and you are running a huge sale, what would you want the subject line to say? ATTN: LCD’s, DVD Players, Music Systems MUST GO!! Up to 80% Off Branded Home Electronics – Discount voucher inside for LCD! In your opinion, which subject line works better? Subject line 2 is much more effective because it lets readers know that LCD’s are on sale at a specific discounted price. It also has a call to action- customers will want to open the email to view the discount voucher. Tangible benefits in the email box are more appealing than promotions which will reveal themselves only on the website. The above title implies to instances where you email the same customer repeatedly. Several companies in the email marketing domain have observed dips in their conversions when they use the same list to send out emails too often. For one, you will be assumed as too pushy by the recipient. You must be cautious and refrain from sending irrelevant or repetitive content. The key here is to strike a balance and to orchestrate a schedule of emails that works best with your line of work. Emails work best to notify customers of lucrative deals they can avail on your site and informing them about new products or services. The heart of an excellent email lies in being relevant, containing informative content, using catchy graphics and evocative text which keeps readers glued. Going Overboard on the First Email! On the very first marketing email, it’s often tempting to send out too many of the items we want the customers to buy. While it’s acceptable to present a few options, but confusing the reader with everything on one plate will read to busy emails which have multiple options, too many graphics/pictures and several places where the customer can click. The best strategy here is to have a single call to action. You must begin with choosing the best deal you think your customers will value and present that in the subject of your email. We can almost vouch that your subscribers will start to open more and more of your emails. By effective utilization of these tips, you’ll be kicking up the speed for producing high quality emails that lead to data-driven conversions and sales. We are confident that these tips are easily implementable, and if you have any questions, don’t hesitate to reach out to us! For more useful tips on the go, Subscribe to our free newsletter here.